This weeks ‘Shot of the Week’ is a photograph from Faye and Ash’s engagement photoshoot over in the Cotswolds a few weeks ago. Its a quirky shot so we thought it would be interesting to share! Half an hour into the shoot Ash asked us if we could create a multi-exposure photograph featuring several images of them, in one frame. 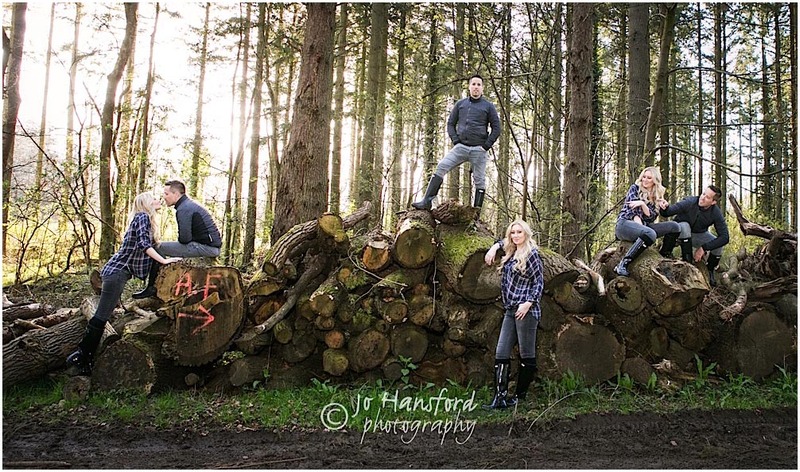 So we found a nice space with a big pile of logs in the woodland we were shooting in, decided this was fit for purpose. We captured several frames of Faye and Ash, each time asking them to move around to stand or sit together on different parts of the pile of logs. The separate exposures were then merged into one final frame post production using photoshop. We like the result, what do we all think? We’d love to hear your views! If you’d like to see more of our engagement or wedding photographs, take a look through our portfolio here. We can’t wait to capture your wedding over at the Great Tythe Barn in Tetbury Faye and Ash, which we know will be amazing!